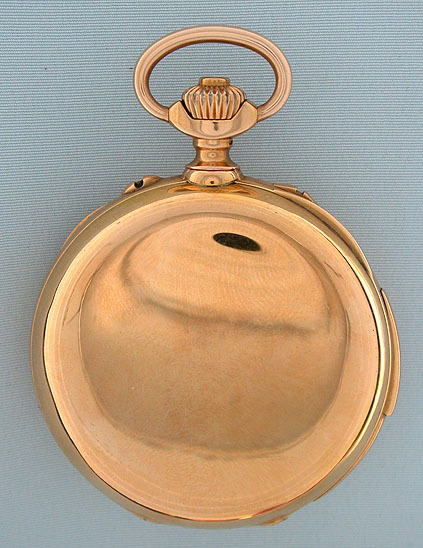 Fine Swiss 18K gold minute repeater chronograph with register antique pocket watch attributed to Meylan circa 1890. 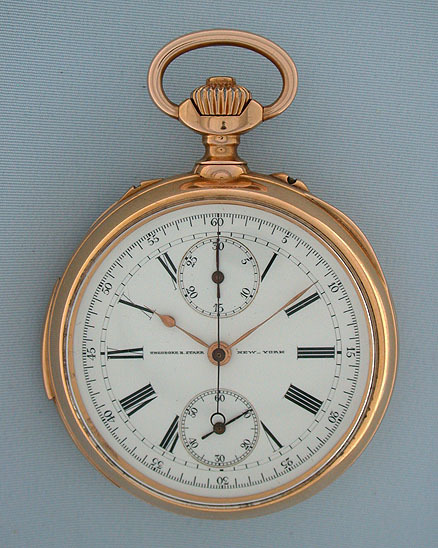 White enamel dial with gold and blued steel hands and subsidiary dial for elapsed minutes for the stop watch function. 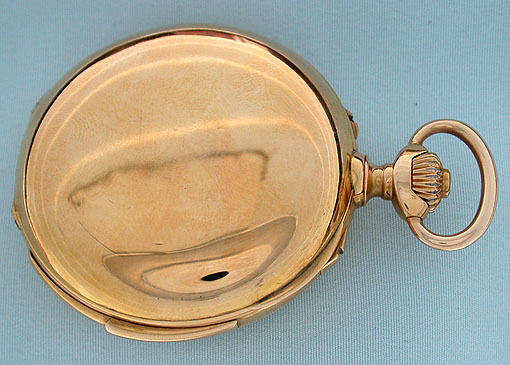 Plain polish case with slide in the band to activate the repeater and button in the crown for the chronograph. When activated, this watch chimes the exact time using different chime tones to designate the hours, quarter hours, and minutes. 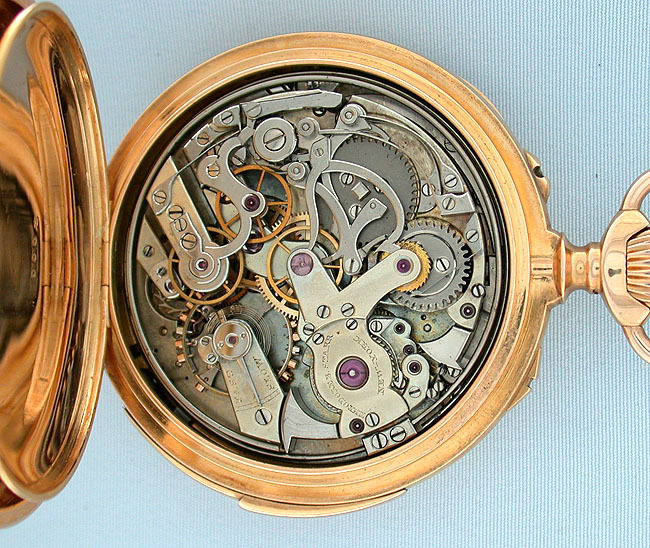 First quality nickel 32 jewel movement. A fine watch with loud clear tome in particularly fine condition throughout. 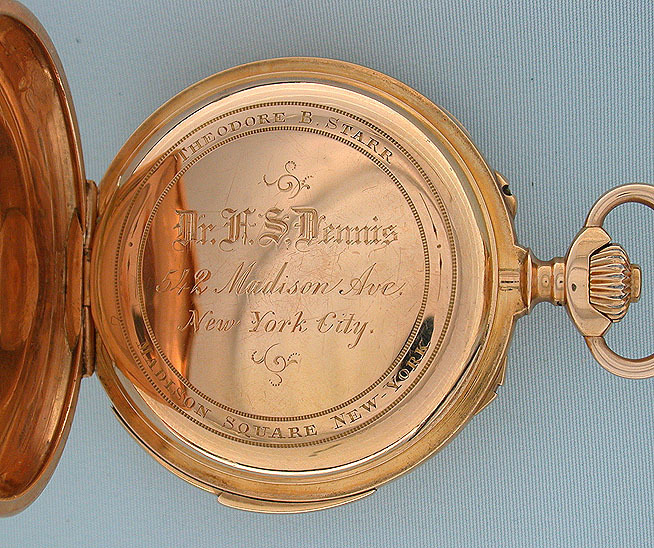 This watch was the property of Frederic S. Dennis, M.D. Dr. Dennis established the nation's first laboratory dedicated to medical research, the Carnegie Laboratory, in 1895. Before Andrew Carnegie donated the funds for the lab, Dr. Dennis had assured him that the new lab would focus on problems of surgical wound healing. Ultimately, these studies led to the introduction of Lister's methods into this country. Dr. W.J. Mayo called Dennis one of the greatest surgeons produced in America. New York City in the mid-nineteenth century was plagued by deteriorating urban health and social conditions. Wretched sanitation and housing, occupational hazards, high infant mortality, and major epidemics were among factors that led to an outcry for public health reforms. Although remarkable advances in surgery were being made by European doctors, Americans were slow to accept these new procedures. Antiseptic methods were cumbersome and not yet widely accepted; surgery was still largely restricted to amputations necessitated by gangrene or accidental injuries. Frederic Shepard Dennis was a medical pioneer, innovative surgeon and leader in hospital reform during this turbulent time. He was a highly regarded and prominent physician who made major contributions to modern medical practices and public health reform. He was honored at an exhibition at The New York Academy of Medicine Library in 1996.